The fighting genre got a breath of fresh air over two years ago when Capcom released Street Fighter IV. It was for the first time a game that gave us a reason to talk about the fighting genre again. 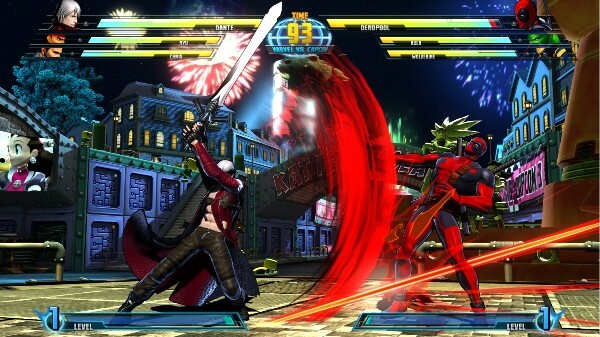 Now two years later Capcom has released the latest in their Marvel vs. Capcom 3: Fate of the Two Worlds that hopes to recapture some of the magic. Does the game have what it takes? Read our full review to find out. The hype surrounding MvC3 has been immense. The series has created a following and for obvious reasons. Outside of the obvious appeal of having Marvel and Capcom characters the Gameplay from the past games is one of great pace and action. So after the long wait can the game make good on its potential? So let’s get into the meat of the game the Gameplay. To start with the roster for MvC3 is one of the games strongest attributes. The developers did an excellent job of not only selecting the stand out characters from both sets but also some of the less known but widely entertaining ones from both rosters. Fans of both Marvel and Capcom will have a good selection of fighters at there disposal but like any fighting game will quickly find a favorite. Unlike past MvC3 games you can see instantly that this game was developed for the console rather then being ported over. This is shown from switching from the two punch and two kick button controls to a light, medium, and heavy attack followed with a special button. It’s a simple tweak but one that makes the controls feel less like a poor excuse for an arcade cabinet to something that actually works on the consoles. There is a new “simple” mode that is designed to give newcomers an easy way to get into the series. However even for me a rather inexperienced MvC3 player it seems out of place and unnecessary. There are some more minor tweaks to the fighting but for the most part this is still a very familiar 3 on 3 fighting game that provides a ton of enjoyment whether playing by yourself or with friends. To me I have always enjoyed this series for its less complex approach and that still holds true. 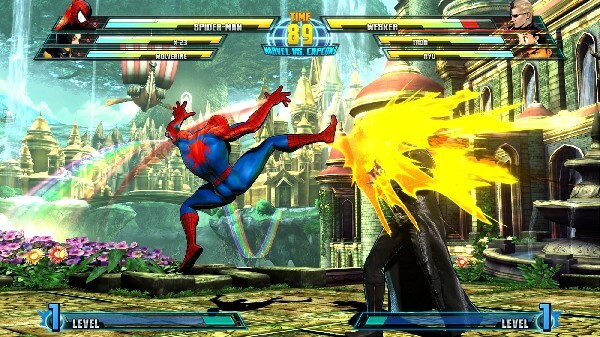 However my big gripe with MvC3 is its lack of depth in the modes category. You have a training mode, a short mission mode, and online play and that’s it. In this day and age of $60 titles this is inexcusable. All in all you have a great playing fighting game that is seriously lacking with ways to enjoy it. For me the visual style of MvC3 is one of its greatest strengths but I can see there being some serious opposition to that statement. Capcom has gone away from its roots and provided us with a much brighter and detailed fighting experience. One thing that has remained is the great use of color both in the environments and characters. The game just pops off the screen and not in a cheesy 3D way. One thing I did want to mention to is that the game visually remains pretty impressive online. Capcom has been working to improve their net code on fighting games and you can see that with MvC3 as it looks and plays extremely smooth online. It’s been a while since I had played a Marvel vs. Capcom title and I am sure Capcom is aware that is the case for many gamers. Thus I can understand the rationale for having a more approachable MvC3 and for me it worked. Although I am not a huge fan of their simple mode I did enjoy the approachability of the game as a whole. Sure you’re still going to need to learn combos, and understand matchups if your going to compete online. However for me the game has always been best when you get a few friends around a TV screen and just battle it out and that remains true in MvC3. My only real problem with MvC3 is that there is really no meat on what proves to be an amazing bone. However for most the lack of modes won’t prove to be a huge miss as the rest of Marvel vs. Capcom 3 is pretty incredible. The fighting is fast and entertaining, the visual style is bright and well detailed, and the roster doesn’t leave any major gaps. All in all if you’re a fan of the series this is a worthy addition and one you should pick up. 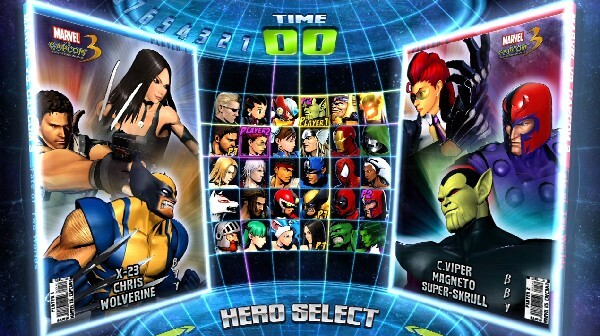 Ultimate Marvel vs. Capcom 3 is a worthy inclusion for any fighting game fan’s collection. It’s a straight port of the 2011 game, but the included DLC makes the purchase worth its price. The graphics don’t feel too outdated, and its comic-book style still holds up as far as 2D fighters go. With a huge roster of fan-favorites, flashy movesets, classic game soundtrack remixes, fair online infrastructure, and medium-defying crossovers, UMvC3 is pure, unadulterated fun. Capcom Fighting Evolution was really just anything it was made out to be. I mean the idea of being able to play as these classic Capcom fighters is a great one, but the execution was so bland and un-original that it just caused me to sit back and wonder why they didn’t put more work into this game to really make it more of a new game rather then a rehash of old 2D fighters. To put the word "ultimate" on the title is quite a risky endeavor, but one this game truly lives up to. For any fan of the series or the fighting genre in general looking for a new game, DOA: Ultimate is a great game for you, go pick it up today! Bloody Roar Extreme is a solid fighting title that will impress those who are just looking for a good time rather then an extensive full force title. The game hosts a very easy pick up and play type style so it can be a lot of fun to play with friends and can also be quite fun to play by your self as well. If you are looking for a fighting title Bloody Roar Extreme might just be for you, I would though highly recommend this as a solid rental title. Marvel vs. Capcom Origins is an acceptable package. While Iron Galaxy did a decent job updating these games in terms of visuals and online play, they couldn’t change the basic gameplay. One of the games included in this package is fun to play and the other is pretty poor. It’s not the worst HD remake you could buy, but there are just too many other ones to make this a must buy.